The Bluetooth Chat sample application demonstrates how you can send and receive data between 2 devices. The following figure illustrates the screens of the sample application. 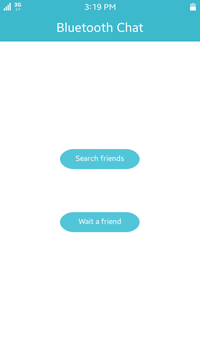 The main screen has 2 buttons for finding devices (Search friends) and creating a server (Wait a friend). 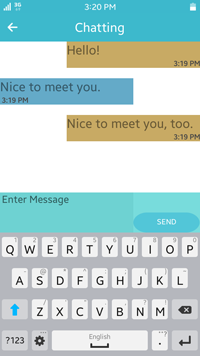 The chat room screen is created with the Message Bubble UI sample application. 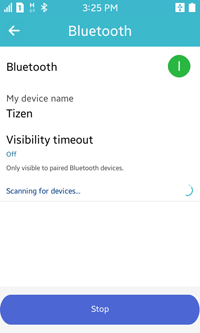 After a button click, the application calls the bt_mgr_initialize() function, and checks whether Bluetooth is on or off. If Bluetooth is off, the application calls the Bluetooth ON/OFF application to switch Bluetooth on. To start the client application, click Search Friends. The client draws its own layout by the _search_layout_create() function, which is called by the bt_mgr_initialize() function. The layout is a list of the found devices. While drawing the list, the application starts finding devices with the _discovery_start() function. Set the device discovery state changed callback, and update the list whenever a new device is found. When the application is successfully connected with the target, the _socket_conn_state_changed_cb() function is called and the application moves to the chat room layout by calling the _bt_chat_room_layout_create() function. To start the server application, click Wait a friend. The role of this application is making a server for chatting, and waiting for a client. Before drawing the proper layout, the application checks whether the device is discoverable by using the _search_layout_create() function. 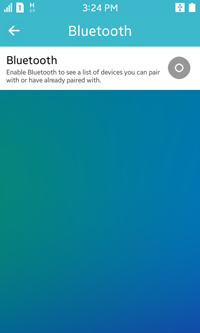 If the device is not discoverable, the application calls the Bluetooth Visibility application. A server application also registers the callback for detecting the state of the socket connection. The callback function is same as that of the client. The application creates a server, and when the socket connection state changes to BT_SOCKET_CONNECTED, it moves to the chat room layout. The chat room is created by calling the bt_chat_room_layout_create() function. The function draws the layout for chatting, and unsets the connection state change callback and reregisters it. It also registers the data received callback. When the message is received from the target, the application makes a message bubble for a new message. When the user clicks SEND, the message on the input area is sent to the target device. If sending is successful, the application makes a message bubble for the sent message.